Use of the Gradle Wrapper is highly encouraged. You should substitute ./gradlew or gradlew.bat for gradle in all following examples when using the Wrapper. Executing Gradle on the command-line conforms to the following structure. Options are allowed before and after task names. If multiple tasks are specified, they should be separated with a space. Options that accept values can be specified with or without = between the option and argument; however, use of = is recommended. Options that enable behavior have long-form options with inverses specified with --no-. The following are opposites. Many command-line flags can be specified in gradle.properties to avoid needing to be typed. See the configuring build environment guide for details. The following sections describe use of the Gradle command-line interface, grouped roughly by user goal. Some plugins also add their own command line options, for example --tests for Java test filtering. For more information on exposing command line options for your own tasks, see Declaring and using command-line options. You can run a task and all of its dependencies. You can learn about what projects and tasks are available in the project reporting section. Most builds support a common set of tasks known as lifecycle tasks. These include the build, assemble, and check tasks. In a multi-project build, subproject tasks can be executed with ":" separating subproject name and task name. The following are equivalent when run from the root project. You can also run a task for all subprojects using the task name only. For example, this will run the "test" task for all subprojects when invoked from the root project directory. When executing the Gradle Wrapper from subprojects, one must reference gradlew relatively. For example: ../gradlew taskName. The community gdub project aims to make this more convenient. You can also specify multiple tasks. For example, the following will execute the test and deploy tasks in the order that they are listed on the command-line and will also execute the dependencies for each task. You can exclude a task from being executed using the -x or --exclude-task command-line option and providing the name of the task to exclude. You can see that the test task is not executed, even though it is a dependency of the dist task. The test task’s dependencies such as compileTest are not executed either. Those dependencies of test that are required by another task, such as compile, are still executed. This will force test and all task dependencies of test to execute. It’s a little like running gradle clean test, but without the build’s generated output being deleted. By default, Gradle will abort execution and fail the build as soon as any task fails. This allows the build to complete sooner, but hides other failures that would have occurred. In order to discover as many failures as possible in a single build execution, you can use the --continue option. When executed with --continue, Gradle will execute every task to be executed where all of the dependencies for that task completed without failure, instead of stopping as soon as the first failure is encountered. Each of the encountered failures will be reported at the end of the build. If a task fails, any subsequent tasks that were depending on it will not be executed. For example, tests will not run if there is a compilation failure in the code under test; because the test task will depend on the compilation task (either directly or indirectly). When you specify tasks on the command-line, you don’t have to provide the full name of the task. You only need to provide enough of the task name to uniquely identify the task. For example, it’s likely gradle che is enough for Gradle to identify the check task. You can also abbreviate each word in a camel case task name. For example, you can execute task compileTest by running gradle compTest or even gradle cT.
You can also use these abbreviations with the -x command-line option. The following are task conventions applied by built-in and most major Gradle plugins. It is common in Gradle builds for the build task to designate assembling all outputs and running all checks. It is common for applications to be run with the run task, which assembles the application and executes some script or binary. It is common for all verification tasks, including tests and linting, to be executed using the check task. You can delete the contents of the build directory using the clean task, though doing so will cause pre-computed outputs to be lost, causing significant additional build time for the subsequent task execution. Gradle provides several built-in tasks which show particular details of your build. This can be useful for understanding the structure and dependencies of your build, and for debugging problems. You can get basic help about available reporting options using gradle help. Running gradle projects gives you a list of the sub-projects of the selected project, displayed in a hierarchy. You also get a project report within build scans. Learn more about creating build scans. Running gradle tasks gives you a list of the main tasks of the selected project. This report shows the default tasks for the project, if any, and a description for each task. By default, this report shows only those tasks which have been assigned to a task group. You can obtain more information in the task listing using the --all option. If you need to be more precise, you can display only the tasks from a specific group using the --group option. $ gradle tasks --group="build setup"
Running gradle help --task someTask gives you detailed information about a specific task. This information includes the full task path, the task type, possible command line options and the description of the given task. Build scans give a full, visual report of what dependencies exist on which configurations, transitive dependencies, and dependency version selection. This will give you a link to a web-based report, where you can find dependency information like this. Learn more in Inspecting Dependencies. Concrete examples of build scripts and output available in the Inspecting Dependencies. 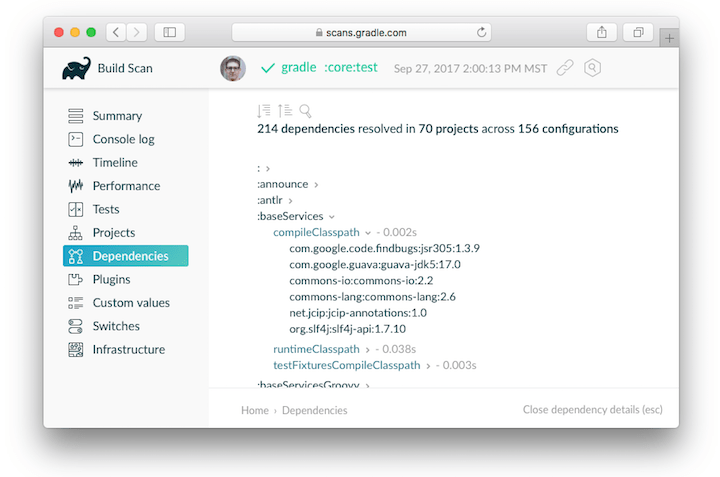 Running gradle buildEnvironment visualises the buildscript dependencies of the selected project, similarly to how gradle dependencies visualizes the dependencies of the software being built. Running gradle dependencyInsight gives you an insight into a particular dependency (or dependencies) that match specified input. 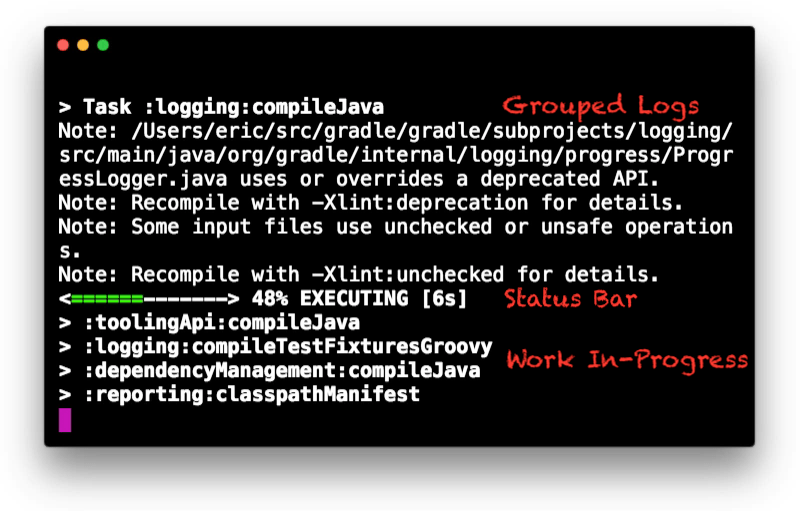 Running gradle properties gives you a list of the properties of the selected project. Learn more about the model report in the software model documentation. Gradle provides bash and zsh tab completion support for tasks, options, and Gradle properties through gradle-completion, installed separately. Shows a help message with all available CLI options. Prints Gradle, Groovy, Ant, JVM, and operating system version information. Print out the full (very verbose) stacktrace for any exceptions. See also logging options. Print out the stacktrace also for user exceptions (e.g. compile error). See also logging options. 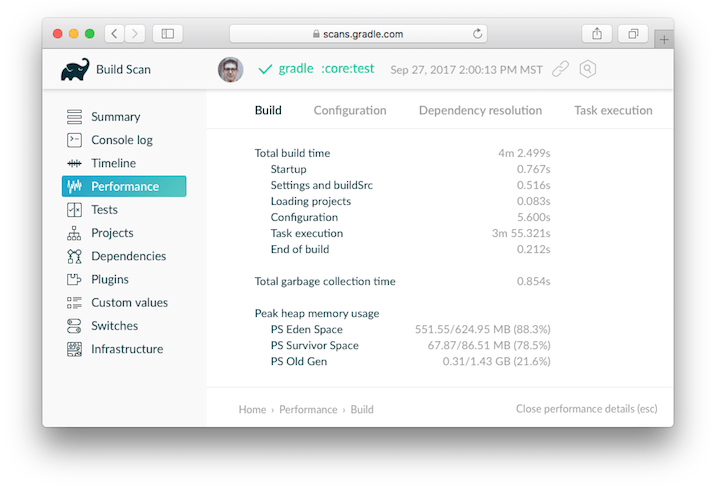 Create a build scan with fine-grained information about all aspects of your Gradle build. Debug Gradle client (non-Daemon) process. Gradle will wait for you to attach a debugger at localhost:5005 by default. Try these options when optimizing build performance. Learn more about improving performance of Gradle builds here. Many of these options can be specified in gradle.properties so command-line flags are not necessary. See the configuring build environment guide. Toggles the Gradle build cache. Gradle will try to reuse outputs from previous builds. Default is off. Toggles Configure-on-demand. Only relevant projects are configured in this build run. Default is off. Sets maximum number of workers that Gradle may use. Default is number of processors. Build projects in parallel. For limitations of this option, see Parallel Project Execution. Default is off. Specifies the scheduling priority for the Gradle daemon and all processes launched by it. Values are normal or low. Default is normal. Generates a high-level performance report in the $buildDir/reports/profile directory. --scan is preferred. Generate a build scan with detailed performance diagnostics. You can manage the Gradle Daemon through the following command line options. Use the Gradle Daemon to run the build. Starts the daemon if not running or existing daemon busy. Default is on. Starts the Gradle Daemon in a foreground process. Run gradle --status to list running and recently stopped Gradle daemons. Only displays daemons of the same Gradle version. Run gradle --stop to stop all Gradle Daemons of the same version. Gradle Daemon will stop itself after this number of milliseconds of idle time. Default is 10800000 (3 hours). You can customize the verbosity of Gradle logging with the following options, ordered from least verbose to most verbose. Learn more in the logging documentation. Set logging level via Gradle properties. Set log level to warn. Set log level to info. Log in debug mode (includes normal stacktrace). Lifecycle is the default log level. Specify console mode via Gradle properties. Different modes described immediately below. Specifies which type of console output to generate. Set to plain to generate plain text only. This option disables all color and other rich output in the console output. This is the default when Gradle is not attached to a terminal. Set to auto (the default) to enable color and other rich output in the console output when the build process is attached to a console, or to generate plain text only when not attached to a console. This is the default when Gradle is attached to a terminal. Set to rich to enable color and other rich output in the console output, regardless of whether the build process is not attached to a console. When not attached to a console, the build output will use ANSI control characters to generate the rich output. Set to verbose to enable color and other rich output like the rich, but output task names and outcomes at the lifecycle log level, as is done by default in Gradle 3.5 and earlier. Specify warning mode via Gradle properties. Different modes described immediately below. Specifies how to log warnings. Default is summary. Set to all to log all warnings. Set to summary to suppress all warnings and log a summary at the end of the build. Set to none to suppress all warnings, including the summary at the end of the build. Gradle’s rich console displays extra information while builds are running. The following options affect how builds are executed, by changing what is built or how dependencies are resolved. Run the build as a composite, including the specified build. See Composite Builds. Specifies that the build should operate without accessing network resources. Learn more about options to override dependency caching. Refresh the state of dependencies. Learn more about how to use this in the dependency management docs. Run Gradle with all task actions disabled. Use this to show which task would have executed. Indicates that all resolved configurations that are lockable should have their lock state persisted. Learn more about this in dependency locking. Indicates that versions for the specified modules have to be updated in the lock file. This flag also implies --write-locks. Learn more about this in dependency locking. Do not rebuild project dependencies. Useful for debugging and fine-tuning buildSrc, but can lead to wrong results. Use with caution! You can customize many aspects about where build scripts, settings, caches, and so on through the options below. Learn more about customizing your build environment. Specifies the build file. For example: gradle --build-file=foo.gradle. The default is build.gradle, then build.gradle.kts, then myProjectName.gradle. Specifies the Gradle user home directory. The default is the .gradle directory in the user’s home directory. Specifies the start directory for Gradle. Defaults to current directory. Specifies the project-specific cache directory. Default value is .gradle in the root project directory. Sets a system property of the JVM, for example -Dmyprop=myvalue. See System Properties. Specifies an initialization script. See Init Scripts. Sets a project property of the root project, for example -Pmyprop=myvalue. See System Properties. Use the built-in gradle init task to create a new Gradle builds, with new or existing projects. Most of the time you’ll want to specify a project type. Available types include basic (default), java-library, java-application, and more. See init plugin documentation for details. The built-in gradle wrapper task generates a script, gradlew, that invokes a declared version of Gradle, downloading it beforehand if necessary. You can also specify --distribution-type=(bin|all), --gradle-distribution-url, --gradle-distribution-sha256-sum in addition to --gradle-version. Full details on how to use these options are documented in the Gradle wrapper section. Continuous Build allows you to automatically re-execute the requested tasks when task inputs change. Gradle will behave as if you ran gradle test after a change to sources or tests that contribute to the requested tasks. This means that unrelated changes (such as changes to build scripts) will not trigger a rebuild. In order to incorporate build logic changes, the continuous build must be restarted manually. If Gradle is attached to an interactive input source, such as a terminal, the continuous build can be exited by pressing CTRL-D (On Microsoft Windows, it is required to also press ENTER or RETURN after CTRL-D). If Gradle is not attached to an interactive input source (e.g. is running as part of a script), the build process must be terminated (e.g. using the kill command or similar). If the build is being executed via the Tooling API, the build can be cancelled using the Tooling API’s cancellation mechanism. There are several issues to be aware with the current implementation of continuous build. These are likely to be addressed in future Gradle releases. Gradle starts watching for changes just before a task executes. If a task modifies its own inputs while executing, Gradle will detect the change and trigger a new build. If every time the task executes, the inputs are modified again, the build will be triggered again. This isn’t unique to continuous build. A task that modifies its own inputs will never be considered up-to-date when run "normally" without continuous build. If your build enters a build cycle like this, you can track down the task by looking at the list of files reported changed by Gradle. After identifying the file(s) that are changed during each build, you should look for a task that has that file as an input. In some cases, it may be obvious (e.g., a Java file is compiled with compileJava). In other cases, you can use --info logging to find the task that is out-of-date due to the identified files. On macOS, Gradle will poll for file changes every 10 seconds instead of every 2 seconds. On Windows, Gradle must use individual file watches (like on Linux/Mac OS), which may cause continuous build to no longer work on very large projects. The JDK file watching facility relies on inefficient file system polling on macOS (see: JDK-7133447). This can significantly delay notification of changes on large projects with many source files. Additionally, the watching mechanism may deadlock under heavy load on macOS (see: JDK-8079620). This will manifest as Gradle appearing not to notice file changes. If you suspect this is occurring, exit continuous build and start again. On Linux, OpenJDK’s implementation of the file watch service can sometimes miss file system events (see: JDK-8145981). Creating or removing symbolic link to files will initiate a build. Modifying the target of a symbolic link will not cause a rebuild. Creating or removing symbolic links to directories will not cause rebuilds. Creating new files in the target directory of a symbolic link will not cause a rebuild. Deleting the target directory will not cause a rebuild. The current implementation does not recalculate the build model on subsequent builds. This means that changes to task configuration, or any other change to the build model, are effectively ignored.